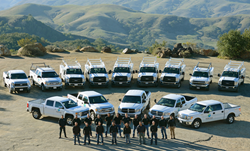 Hortau's grower support team in California. Hortau, a provider of precision irrigation management systems and services since 2002, has secured $10 million in financing to fuel company growth and broaden its service offering to growers in North America. The investment is the third major round of financing in the past 20 months for Hortau, establishing itself as a proven leader in precision irrigation management for agriculture. The $10 million U.S. investment comes from a group that is led by Advantage Capital Agribusiness Partners, LP (ACAP), and joined by BDC Capital, Inc., and repeat investors Avrio Ventures LP II and Capital régional et coopératif Desjardins. Hortau CEO Jocelyn Boudreau said the investment will allow Hortau to continue growing its operations, expanding on its success from 2015. Last year, Hortau launched a new line of ST irrigation management systems, an upgraded automation platform, and significantly upgraded its software and mobile applications. To remain at the forefront of crop stress and irrigation management technology, Hortau will further grow its technical, grower support and R&D teams in 2016 and also expand into additional regions. Hortau’s smart irrigation management system, combined with its easy-to-use mobile software, reports to growers how crops are faring in real time – before stresses such as drought or lack of aeration can have a negative impact on the crop. This proprietary, plant-centric approach helps detect plant stress using soil tension, ensuring optimal crop growth, and reducing water and energy consumption, as well as environmental impacts such as fertilizer leaching. Advantage Capital Agribusiness Partners, LP (ACAP) is a $154.5-million fund, licensed as a Rural Business Investment Company (RBIC) by the U.S. Department of Agriculture (USDA), focusing on businesses involved in the production, processing and supply of agricultural products. Visit Hortau.com for more information on Hortau’s proprietary irrigation management systems, and simplified software and mobile apps, or contact us at (805) 545-5994, Ext: 358, or media(at)hortau(dot)com. It is a partnership between Advantage Capital Partners and nine Farm Credit organizations: AgCountry Farm Credit Services (Fargo, N.D.); AgStar Financial Services (Mankato, Minn.); AgriBank (St. Paul, Minn.); Capital Farm Credit (Bryan, Texas); CoBank (Denver, Colo.); Farm Credit Bank of Texas (Austin, Texas); Farm Credit Services of America (Omaha, Neb. ); Farm Credit Services of Mid-America (Louisville, Ky.); and United FCS (Willmar, Minn.). Farm Credit supports rural communities and agriculture with reliable, consistent access to credit and financial services. Avrio Capital was established in 2006 to identify and invest in innovative food and agriculture companies that provide solutions to global challenges in the areas of health, wellness and sustainability. Avrio is a hands-on investor that works alongside its portfolio companies to provide the support and resources needed to transform emerging companies into successful, globally competitive enterprises. For more information, visit AvrioCapital.com. From venture capital to equity to growth and transition capital, our team of over 100 experienced, local professionals partner with entrepreneurs to identify and meet their needs on flexible terms. Some of the sectors in which we specialize include IT, industrial/clean/energy technology, and healthcare. For more information, please visit http://www.bdccapital.ca or follow us on Twitter at @BDC_Capital. Desjardins (CRCD) has a real affinity for SMEs. Since its inception in 2001, CRCD, a public corporation, has actively participated in Québec’s economic development. Together with its manager, Desjardins Business Capital régional et coopératif, CRCD has deployed innovative and unparalleled solutions in the entrepreneurial market in the form of various partnerships that now form its ecosystem.